Lately, I’ve been thinking about how busy we all are these days. Too busy to do housework, to cook, to plan, to communicate. Too busy to read. Too busy to pray. I share this because I’ve been so “too busy” that it’s taken me literally months to share this fabulous (and very brief) interview with my dear friend and fellow Catholic author Donna-Marie Cooper O’Boyle. I’ve once again let “perfection be the enemy of the good.” Part of my justification is that you — my friends who visit this space — are busy too. To be honest, I’ve contemplated for the past few months whether my blogging is even relevant any more. Shouldn’t we all just head over to Instagram and look at pretty pictures or express our deepest ponderings on Twitter in 280 characters or less? In the end, it’s the critical subject matter of Donna-Marie’s work that has motivated me to hit the keyboard again. In our interview below, she shares her latest passion project: Feeding Your Family’s Soul. In an age when we may feel too busy to even dine together or converse with one another, Donna-Marie’s wisdom couldn’t be more timely. This interview will be hopefully just the first in a series I’m going to call “3 Minutes with …”. With these posts, I hope to share cool people doing awesome work, but also to honor your busy schedule. Enjoy! Q: Congratulations, dear Donna-Marie, on your beautiful work with Feeding Your Family’s Soul! For readers who don’t know you as well as I do, please briefly introduce yourself and your family. Thank you very much! I am a mother of five and a grandmother of a two-year-old. I have another grandchild coming very soon! It’s very exciting! The vocation of motherhood is so amazing and being a grandmother is an extra special blessing! Q: You work tirelessly on behalf of all kinds of families. Tell us about this particular project, and why it’s so needed at this time? Thank you for asking. I felt very inspired to offer the Catholic tools, if I may, to parents and grandparents so that they could step up to the plate to BE that first and foremost educator to the children that they are called to be. I know it’s difficult to contend with so much coming at us at all times from the culture and just the sheer busyness in our vocations which can cause us to be exhausted and distracted. I wanted to aid the parents and grandparents in carving out the time to teach the Faith. Q: I must admit to being just about the most non-domestic mom out there, but I don’t want readers to think that this is simply a glorified cookbook. While you include recipes here (and they look delicious! ), there is more of an emphasis on “spiritual feeding” for our families. Why the emphasis on mealtime as an opportune time to share our faith? Yes, absolutely. This is not really a cookbook for food recipes, though I do sprinkle them in for fun. The main purpose of this book it to provide Faith lessons for the family. I have included 53 lessons–one for every week of the year and one we can call “extra credit.” That’s because after I finished the 52 lessons I realized that I needed to add a lesson on the Holy Angels. I have created a simple way in which to teach the Faith right at the dinner table while you have your captive audience! There are reflection questions that follow a simple short lesson. The family is sure to enter into a fascinating discussion of the Faith and the lesson is carried out throughout the week through simple theme extensions. Q: How can this book be used by empty nesters like me, or single folks, or those without children? This book can be used by anyone wanting to learn a bit more about the Catholic Faith. It is designed to carry out in a family setting but can be utilized in many situations. Empty nesters can use this book with their grandchildren. Q: The project involves more than a book! Please say a few words about the DVD that you’ve created with Paraclete? Yes, you are right! 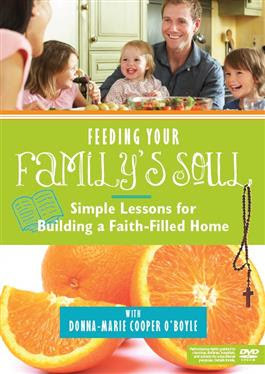 I have created a DVD produced by Paraclete Press: Feeding Your Family’s Soul: Simple Lessons for Building a Faith-Filled Home. I have provided seven lessons that will get the caregivers and teachers pondering and praying about teaching the Faith to the children. Hopefully, these lessons provide inspiration and the Catholic tools to help to teach the Faith. Q: Do you have a favorite recipe and chapter in the book? Why are they important for you? Q: Congratulations on being a grandmother! How does this new phase of your life as a mother convict you about the need to feed our families’ souls? Thank you so very much! Being a grandmother thoroughly emphasizes in my heart the need to continue to teach the Faith through the generations, to strive to be a Christian example to the little ones — to let Christ’s love and light shine through us — imparting the Faith always. Q: What’s next for you and where can readers catch up with you? Thanks again for asking. Readers can catch up with me through my two websites: DonnaCooperOBoyle.com and FeedingYourFamilysSoul.com. I have a new television series on EWTN which is also called Feeding Your Family’s Soul. It can be seen in the EWTN “At Home with Jim and Joy” show where I come in for visits! I hope that readers will subscribe to my free email newsletter through my website (the right-hand column). I like to share inspiration as well as news, and more. I have a few new books coming up! Stay tuned for those. I just released a book A Catholic Woman’s Book of Prayers in the second edition and come spring 2018 will have a new book for Catholic Moms: Catholic Wisdom For a Mother’s Heart. As well, I will release By Dawn’s Early Light: A Prayer Book for Women in the Service and Military Wives. As we speak, I am working on others! Discover all of Donna-Marie Cooper O’Boyle’s books here. Thank you Lisa and Donna-Marie!!! I just needed the reality check and encouragement after a particularly weary day. Looking forward to getting Feeding Your Family’s Soul.